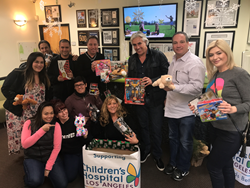 Treeium Inc., one of the leading remodelers on the west coast, reveled in the holiday spirit by hosting its 2nd annual toy drive to provide toys to children in need. Treeium Inc. held its 2nd annual toy drive this year to help provide toys for children who are missing their comforts of their home. With this small gesture of kindness, we hope to touch the hearts of many children who have to spend time in the hospital for the holiday season. Treeium has always been a big believer in giving back to our communities, as Moty Ginsburg, CEO and Founder of Treeium states, “There’s nothing more rewarding than giving. With that one act of kindness and caring, it can truly make a change for the better." What a perfect way to end the 2017 year by contributing to an organization that truly makes an impact for children on a day to day basis. Children’s Hospital Los Angeles provides the highest quality healthcare for children in the region and beyond. As the first and largest pediatric hospital in Southern California, CHLA relies on the generosity of philanthropists in the community to support patient care, leading-edge education of the caregivers of tomorrow and innovative research efforts that impact children at CHLA and all around the world.